Already a star of the London 2012 Olympic Games, double amputee Oscar Pistorius – aka Blade Runner – is now poised to make an even greater impression on the Paralympic Games. 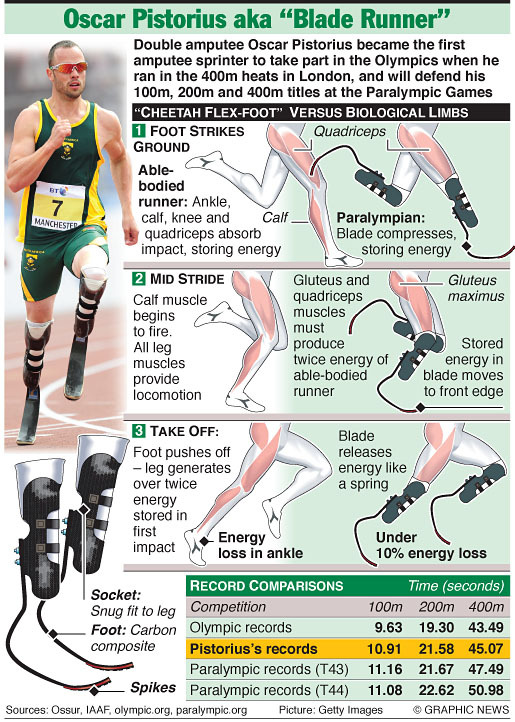 Today’s graphic looks at how Pistorius’ blades work and compare them to human limbs. You might also be interested in the latest edition of the E&T podcast, in which we talk to Richard Hirons, clinical specialist prosthetist at Össur UK Ltd, about his company’s involvement in the design of Pistorius’ running blades. All our podcasts are free to download.